From I-75, take exit 136 and head West on Colonial Boulevard. Drive west about three and one quarter miles. After crossing Metro Pkwy, turn right immediately after passing McDonalds, at the entrance to the Lee County Public Education Center. Then drive left back towards the railroad tracks to our coral colored station. From US-41, head East on Colonial Boulevard about three quarters of mile. 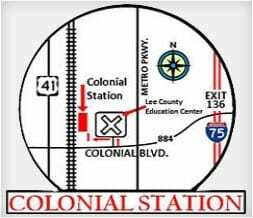 Immediately after crossing the railroad tracks, turn left into the entrance for the Lee County Public Education Center. Then drive left back towards the railroad tracks to our coral colored station. From Daniels Parkway heading north along Metro Parkway. Take Metro Parkway North approximately 6 miles from Daniels. Using the right left turn lane, turn left onto Colonial Boulevard (heading west), then turn right immediately after passing McDonalds, at the entrance to the Lee County Public Education Center. Then drive left back towards the railroad tracks to our coral colored station. From Downtown Fort Myers heading south along Metro Parkway. Proceed South on Metro Parkway to Winkler Avenue. After crossing Winkler, continue south on Metro Parkway approximately ¼ of a mile and turn right onto the entrance road of the Lee County Education Center. At the stop sign, turn left and proceed left around the parking lot loop road past the McDonalds, 5/3 Bank, and the used car dealer until you reach our coral colored passenger station. You will see signs for Murder Mystery Dinner Train parking. Please allow an extra 20-30 minutes of travel time due to seasonal or construction traffic.